Social media marketing can be confusing. Do you really need to be involved on every site every day? Is there a limit to what you should do? There are always a growing number of questions behind every business’ head when it comes to growing their business. You want to do it correctly, gain followers, and ultimately clients as well. Adding to this confusion is the growing number of social media sites out there. Where it used to be just Myspace, you’re now left with dozens of sites, each more popular than the next. Take a look at the five social media sites you’re not using but should be, and how they can make your business boom. grown in the past year, gaining in followers and including subscribers from celebrities, to famous bloggers, and big companies. The idea is simple, you “snap” about your day, leaving small tidbits of information and insight for your followers. Because posts only last for twenty-four hours, you’re able to offer deals and information that encourages followers to not just follow you, but remain up-to-date for details. Get on Snapchat and watch the number of your followers climb. One of the newest, and perhaps brightest, applications to come along is Periscope. Periscope has been particularly popular with businesses that host Q & A sessions, where their followers are not just able to follow along, but submit their questions and comments at the same time. Periscope, like Snapchat, allows followers to view their video for up to 24-hours, but unlike Snapchat asks followers to communicate via a live experience. Many bloggers have found success with DIY projects or recipe building while on Periscope, as well, making it an ideal solution for many businesses of all types. You might be surprised, but YouTube is not used by businesses the way it should be. YouTube is something that can be beneficial for businesses across the board. However, for whatever reason, it goes underused. If your business isn’t utilizing YouTube yet then you should look into doing so today. Find an angle that you can work for your company, one that hasn’t been done a million times already, and you’re likely to find yourself with a handful of new followers and potential clients. With over a billion users, your company isn’t utilizing social media marketing to its full potential unless it uses YouTube and its users, as well. Like YouTube, Pinterest is one of those applications that are used less than it should be. Sure, bloggers use Pinterest to build their brand, but aside from them there are only a handful of businesses that use it to their advantage. If you’re doing an Internet marketing campaign for your company then you’re likely putting out content writing, infographics, and more to propel your business forward. Pinterest is an ideal outlet for this kind of information, allowing you to share your company’s work and have it shared (actually pinned) across Pinterest boards. This in turn increases your visibility, and helps get your work seen by people interested in the same things as you. Instagram is one of the most used social media platforms available. In fact, it’s pretty much second when compared to Facebook. However, despite how used it is by the average person, the number of businesses that utilize it is very small. While there are many clothing stores that use it, there are less businesses from other departments that take advantage of the follower number. As Instagram grows, so does the number of ad space available, meaning that it is becoming more important than ever to invest in it. Add to this the possibility of creating a following based on Instagram posts and you’ll be sure to find an increase in sales and followers. 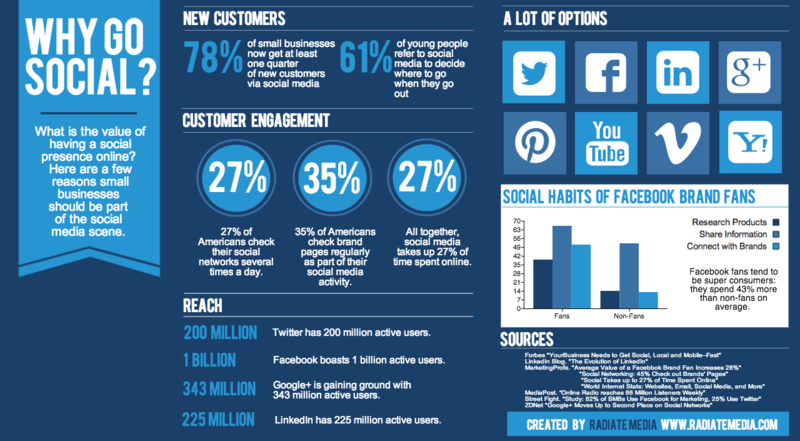 What social media platform do you find under utilized by businesses? Comment below with your best used social media platform!